Good for strollers and shoppers, this pedestrian street is also great for dining. 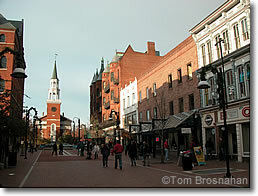 The heart of Burlington VT for visitors and locals alike is Church Street Marketplace, a four-block stretch of Church Street from Pearl Street to College Street closed to vehicular traffic (map). This pedestrian mall has been beautified with trees, benches, and sidewalk cafes, and it's busy with strollers, street vendors, shoppers, lovers, performers, and sidewalk bench conversationalists on any day when the weather's fine. This is traditionally the place to go in search of Burlington's best dining. Old restaurants keep their customers, and new ones always want to open where the crowds are: on Church Street. At the northwestern end of Church Street stands the pretty Unitarian church, built in 1816.
with the Unitarian Church at the far end.